A nightstand next to a bed is as important as a bed is to a great bedroom. Nightstands must be functional and dependable, but that doesn’t mean that they can’t add just the right touch of style. Our wide selection of nightstands will fit any decorating need you may have for toddlers, children, and teens. Many of our nightstands work as transition pieces that you use no matter how you redecorate, whenever you redecorate. 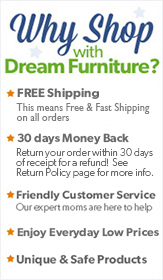 With styles ranging from classic and traditional, from boys to girls to adults, from pretty to rugged, DreamFurniture.com has just the nightstand you are looking for.